49 w w w . M o d e r n T i r e D e a l e r . c o m A/T. e performance delivered is about 90% of the off-road (mud, sand, gravel) of our M/T, but a significantly lower noise level and improved overall on-road manners for steering, braking and comfort. Scott Jamieson, Cooper: An R/T, or rough/rugged terrain tire, blends the more aggressive look of a mud tire with the more comfortable ride and long-lasting per- formance of an all-terrain tire. R/T tires generally enhance the look of the truck over and above what the OE tire provides and give the driver greater off-road traction compared with an all-terrain tire. And, R/T tires are not as noisy or harsh riding as mud tires generally are. R/T tires are a great way to enhance the curb appeal of a vehicle and do so without giv- ing up ride comfort. An R/T tire is generally considered a notch above an all-terrain tire in terms of off-road performance enhance- ments. It's a great tire for the mid-level enthusiast — someone who is doing more than just driving to the river to go fishing, or out to the trails when it snows. ese tires are for people who really like to go off-road regularly, but might not be as serious as those who travel to extreme off-road destinations as a passion. An R/T tire can generally handle soer ground and more uneven terrain than an all-terrain product can. Drew Howlett, Falken: We define an "R/T" tire as a "hybrid" tire, in-between an "all-terrain" type tire and a traditional "mud-terrain" type tire. We know many SUV and light truck consumers want the aggressive looks of mud-terrain tires, but they don't necessarily need the extreme off-road capability that those tires provide, nor do they want the on-road compromises. During the alliance between Sumitomo Rubber Industries and Goodyear, the Dunlop Radial Rover R/T was born; I'd venture to say this was one of the first if not the first "R/T" tire in the U.S. market. e Dunlop Radial Rover R/T featured an all-terrain-like center tread with open shoulder blocks, which were pinned for studs. Since then, the Goodyear Wrangler DuraTrac and Cooper Discoverer S/T MAXX joined the hard-working R/T tire crowd, and were adopted by many consumers for aesthetic reasons over capability. is was the first group of hybrid R/T tires in my mind. Today the Toyo Open Country R/T and Nitto Ridge Grappler, along with some lower tier offerings, represent the modern R/T-type tire in the U.S. market. Daniel Gode, Hankook: While not officially named, the market appears to have defined the segment as somewhat of a hybrid, using terms such rough-terrain, rugged-terrain, hybrid-terrain, and extreme all-terrain. It appears that the intent is to meet the demand for on-road comfort and performance while providing the more aggressive appearance of a mud-terrain tire. e visual element comes from a more distinct looking, and sometimes practical, shoulder and sidewall design while attempting to reduce noise and vibration by keeping a lower void ratio in the tread pattern. Brandon Stotsenburg, Kenda: Tradi- tional A/T tires have been trending toward more on-road applications, featuring lower noise and oen offering mileage warran- ties. is has opened an opportunity for a compromise of a more traditional A/T tire with an off-road M/T tire as shown by the "rough- or rugged-terrain" label. e end user is likely to be either a work truck or aspirant consumer who wants the look of an off-road tire and feel of an A/T tire. is tire must be capable of strong off-road performance with enhanced winter performance in addition to reasonable noise and ride. Kenda introduced its new Kenda Klever R/T KR601 product targeted specifically at this segment in late 2017 aer spend- ing considerable resources at our Akron Technical Center to properly benchmark and develop a tire specifically for the North American consumer. We describe the Klever R/T as follows: "Premium performance for the value-driven consumer designed to conquer rough terrain without sacrificing the ride and comfort of an A/T tire, offering exceptional durability with aggressive styling, an optimized tread design provides the right solution for 4x4 owners on the road, in the snow or in any off-road environment." The R/T tire needs to perform at an off-road level comparable to the M/T tire, but really allow the consumer to experience on-road ride and noise comparable to a traditional A/T tire. Chris Han, Kumho: A general definition for the R/T tires would be a quieter M/T product with better handling on the road. John Wu, Maxxis: A tire with a void ratio somewhere between M/T and A/T. Hans Dyhrman, Nokian: R/T tires provide maximum durability, stability and performance for the instances when pave- ment or asphalt is not an option. At Nokian Tyres, we build our products with safety, longevity and sustainability in mind. at same mind-set is still relevant when it comes to R/T tires, but in addition to that, we are always working to ensure all our tires are tailored to meet the expectations of the adventurous and fearless consumer. Michael Cati, Omni United: Rugged- terrain tires are a combination of all-terrain and mud-terrain tires. 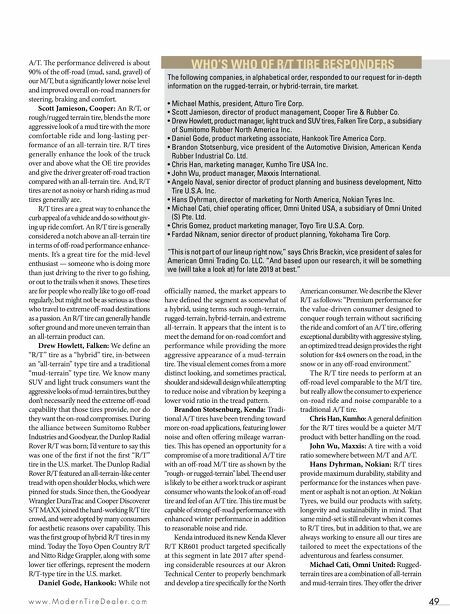 ey offer the driver WHO'S WHO OF R/T TIRE RESPONDERS The following companies, in alphabetical order, responded to our request for in-depth information on the rugged-terrain, or hybrid-terrain, tire market. • Michael Mathis, president, Atturo Tire Corp. • Scott Jamieson, director of product management, Cooper Tire & Rubber Co. • Drew Howlett, product manager, light truck and SUV tires, Falken Tire Corp., a subsidiary of Sumitomo Rubber North America Inc. • Daniel Gode, product marketing associate, Hankook Tire America Corp. • Brandon Stotsenburg, vice president of the Automotive Division, American Kenda Rubber Industrial Co. Ltd. • Chris Han, marketing manager, Kumho Tire USA Inc. • John Wu, product manager, Maxxis International. • Angelo Naval, senior director of product planning and business development, Nitto Tire U.S.A. Inc. • Hans Dyhrman, director of marketing for North America, Nokian Tyres Inc. • Michael Cati, chief operating officer, Omni United USA, a subsidiary of Omni United (S) Pte. 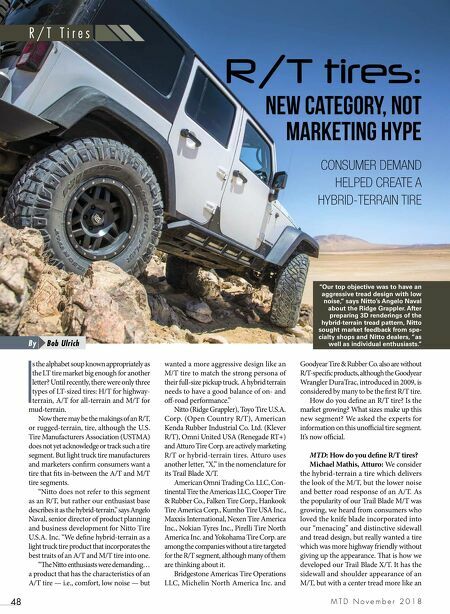 Ltd. • Chris Gomez, product marketing manager, Toyo Tire U.S.A. Corp. • Fardad Niknam, senior director of product planning, Yokohama Tire Corp. "This is not part of our lineup right now," says Chris Brackin, vice president of sales for American Omni Trading Co. LLC. "And based upon our research, it will be something we (will take a look at) for late 2019 at best."